Salem senior Max Jacques was named as WGAM Radio’s 9th Annual Mr. Football Award Winner tonight in a ceremony at the Hilton Garden Inn Manchester. 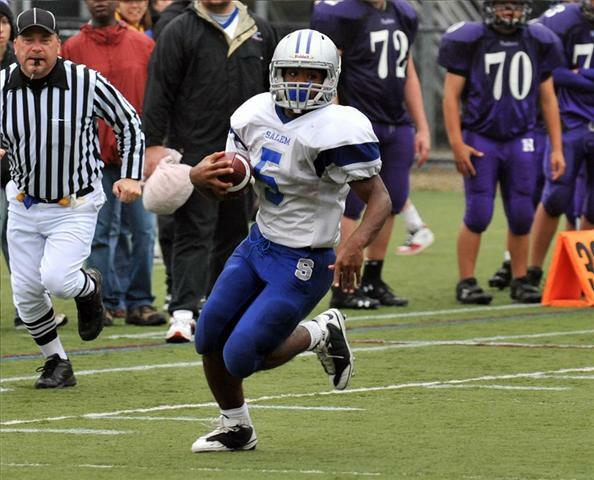 Jaqcues ran for 1904 yards and 26 TDs for Salem this past season. Modeled after the High School Heisman Trophy, the Mr. Football Award recipient is determined by votes cast by WGAM’s Friday Night Light’s staff as well as by other members of the New Hampshire media. Jacques joins past winners Jeff Farrington of Souhegan High School in 2002, Mike Boyle of Plymouth in 2003, Dave Philistin of Manchester Central in 2004, John Sughrue of Pinkerton Academy in 2005, Mark Spinney of Bishop Guertin in 2006, Londonderry’s Alex Theodhosi in 2007, Nashua South’s David Zocco in 2008 and Steven Jellison of Souhegan in 2009. WGAM-AM 900 and WGAM-AM 1250 are all-sports talk stations located in Nashua and Manchester. Their signals cover the Southern New Hampshire region. In addition to the popular “Friday Night Lights” and “The Home Team” local shows, the stations feature Red Sox baseball, Patriots football, is home to The Manchester Monarchs and national talk from ESPN Radio. The company also owns WSMN-AM 1590, Nashua’s local news and talk radio station.